Early boarding, here we come. I just returned from a weekend trip to Northern California with my son Joshua, now 13 years old. I couldn’t believe how pleasant it was — nothing like how traveling with baby Josh used to be. “How can such a small human being create so much luggage,” I cried in exasperation one weekend when Josh was about 6 months old. I was flying up to Northern California for a weekend concert engagement. I couldn’t possibly haul all of our stuff and manage an infant, so I asked my friend Sarah to come along. She only required a duffel bag for the three days, and I one suite case. In contrast, Joshua required a stroller, a car seat, baby carrier, a portable baby bath tub, a “portable” play pen/crib, and a suitcase bigger than mine and Sarah’s combined. I must have thought that they don’t sell diapers nor baby food in San Francisco. The best thing about traveling with young children is early boarding. I tried to pass my teenager as a 5-year old on this trip, but no success. The second best thing is that kids fly free until they are two years old. Before you get all excited about this, you must be aware of its advantages and disadvantages. The good news is that you don’t have to pay for a ticket for the baby. The bad news is that there is no seat for your baby either. If you’re lucky, you can get on a flight with an open seat next to you, but chances are you are stuck with a child bouncing on your lap for the entire flight. More than once, the passenger next to me got up and moved to a different seat. I wasn’t sure if he was being kind or simply escaping, but I was just glad he opened up the next seat. For reasons I do not understand, the FAA regulates that I hold the lap infant during take-off and landing instead of allowing me to tuck the kid under my seat belt or in the seat pocket in front. It’s not so bad during the take-off, but on the landing, I’m just barely keeping my baby from flying away from me. And diapers. Oh, have you ever tried changing a dirty diaper in the tiny lavatories they have on those planes? Where, pray tell, do you place the baby during the change? Some planes have one dedicated lavatory equipped with a “baby changing table,” but it’s no bigger than the tray table at your seat. I was absolutely not going to change him on the dirty bathroom floor, so I often resorted to using the toilet lid as a make-shift changing table. I wrestled the baby from wiggling off the round, curved lid. I often staggered out of the lavatory holding a crying baby with a very crooked diaper. I was so desperate once on a flight to Japan with baby Josh that I began to change him on the floor right at my seat. The flight attendant discovered this and immediately forbade me, so I then went to the galley where I found a counter perfectly situated for a diaper change. Right away, another flight attendant found me out and shooed, “It’s unsanitary. Please do it ON your seat.” She obviously was not a mother. Have you ever tried changing a baby on your airplane seat? Unless your child is a 6 x 8 rectangle and doesn’t move, it is quite impossible. I was nearly in tears until another flight attendant — most certainly a mom — stood at guard while I did the duty back on the galley counter top. I owe her a million miles. As you can see, traveling with a teenager is much more pleasant than with an infant. How about you — travel with babies much? 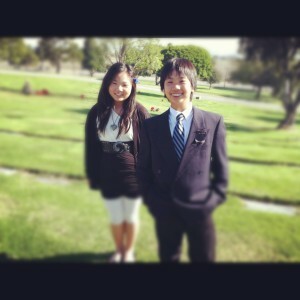 Meg and Josh, alive and well today and above ground at a cemetery. Before I begin this post, I just want you to rest assured that my kids are still breathing and somehow managed to make it through infancy with a Panda Mom like me. It’s amazing that I also made it alive through the long, tortuous period of sleep deprivation. How do other parents do it? My firstborn was finally out of the newborn phase, now a plump 3-month old. I was starting to get the hang of this new season in my life known as motherhood and getting used to sleeping in 90-minute chunks…sort of. Josh, being a slow and inefficient nurser, demanded a 30-minute feeding session every two hours. He also contractually demanded that I be sitting up while I fed him rather than lying down, which precluded me from drifting to sleep while nursing (which, mercifully, Meg allowed me to do when she was born two years later, but that’s another post). At least I learned the sprinkling system pattern at our apartment complex and when the newspaper was delivered each morning in the wee hours. “I can do this mom thing,” I said confidently to myself as I hoisted the loaded car seat into the back of my Toyota 4-Runner. I opened the garage door to welcome in the sunny Southern California morning. I strapped myself into the driver’s seat, and I even touched up my lipstick in the rear view mirror which reflected a just-fed, sleeping bundle of joy. I figured I had about an hour to run my errands. I turned on the ignition and put my car in reverse. I had backed into my husband’s Acura Integra. “Why did he park his car there? !” was my first reaction. 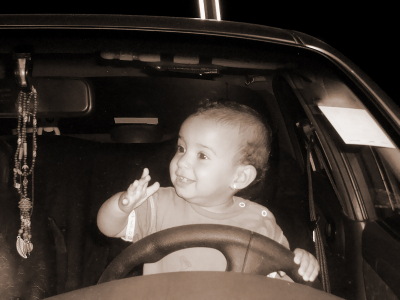 Then I realized that I didn’t bother looking beyond my baby in the rear view mirror. “How am I going to explain this one?” was my next thought. I got out of the car to examine the damage, which looked extensive on both ends. Time to call 21st Insurance. “You’ll be surprise to know that this occurs more often than you think,” the insurance agent reassured me on the phone. While that helped alleviate the pain and embarrassment of this incident just a little, it still was a costly mistake. I told them that I could sue the other driver, but this agent had no sense of humor. I read on AAA Foundation’s website a sobering fact: “Some studies have found people’s cognitive-psychomotor abilities to be as impaired after 24 hours without sleep as with a BAC of 0.10%, which is higher than the legal limit for DWI conviction in all US states.” We are drunk with sleep deprivation! 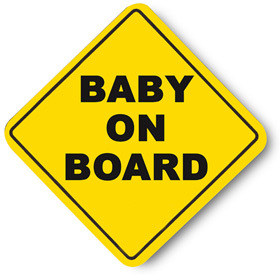 Maybe those obnoxious “Baby on Board” signs on cars are really there to warn everyone around them that a mom is driving under the influence of no sleep. Translated: Warning! Mom has not slept in 3 months! Okay, you might be mortified to know what an idiot this Panda Mom could be. But maybe some of you have a story that can top mine. Would you please share it in the comments here below to help me feel a little better about myself? Thank you.